Party season is here and if you’re scratching your head trying to come up with an appetiser to serve with drinks for Thanksgiving, Christmas, New Years Eve or any other party then look no further because these little bundles of deliciousness are awesome. Crispy puff pastry encloses savoury meat that’s sweetened with caramelised onions and then sharpened up with a generous dose of vintage cheddar before being baked to golden perfection. 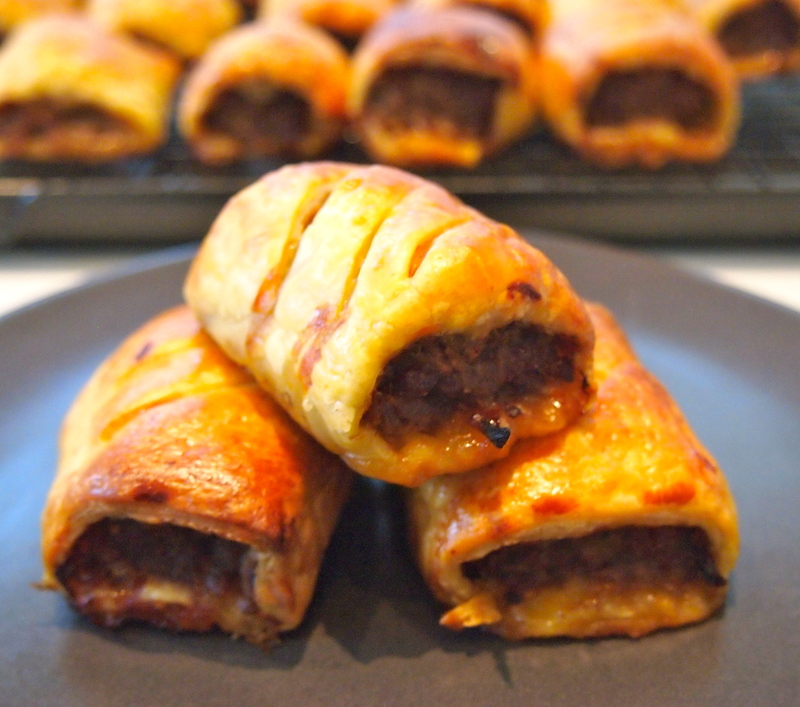 Apart from being just about the best sausage roll I’ve ever had there are another couple of benefits to this recipe. 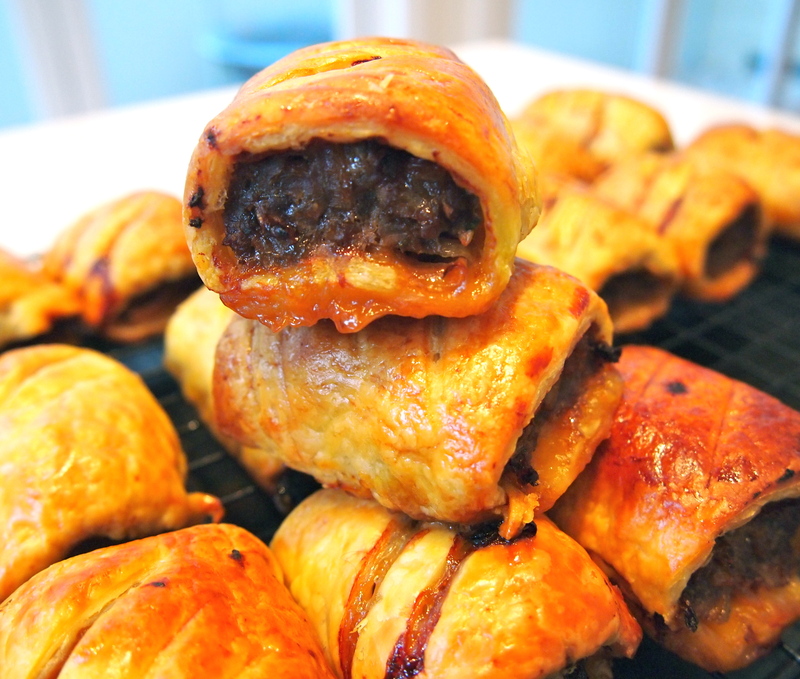 The first being that unlike traditional sausage rolls no pork is used, so if you’re entertaining people who may be pork averse you don’t need to worry and secondly they are super easy to make. They can in fact be made days in advance and refrigerated until you’re ready to bake them. The only stipulations I make is that you use the best quality lean beef mince you can find, organic is preferable, and that the puff pastry be an all butter one. Once those two items have been taken care of the rest is a breeze. To make the caramelised onions, heat a non stick fry pan over medium heat and add the oil and butter. When the butter has melted add the onions and cook stirring frequently until lightly golden. Add the sugar and balsamic and continue cooking until well caramelised, making sure not to burn them. Remove from the heat and set aside to cool. Preheat oven to 220C and line one large or two medium size baking trays with baking paper. Place beef, carrot, cheese, parsley and thyme in a bowl and season well with salt and pepper. Add the cooled onions and mix until well combined. Cut pastry sheets in half. Prepare egg wash and brush egg wash along one long edge of each piece of pastry. 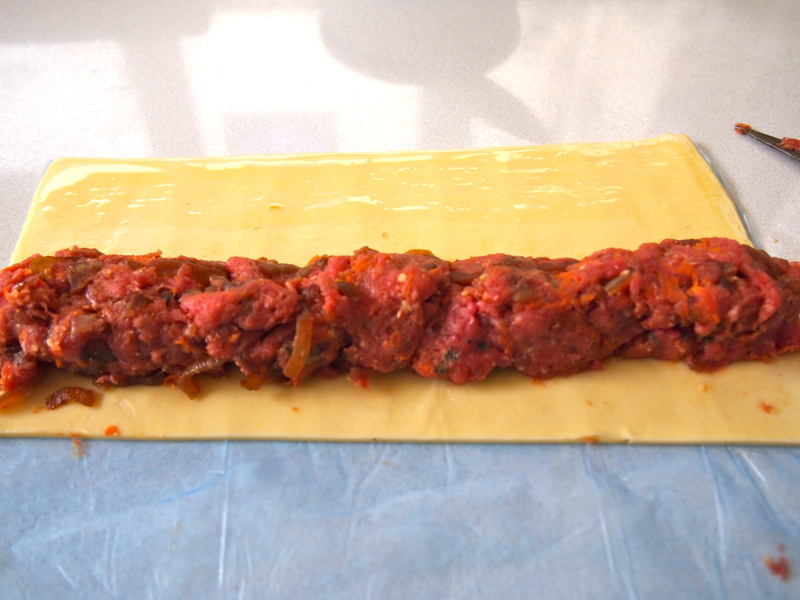 On the opposite long edge, shape a 3cm diameter sausage of the beef mixture. Starting from the long edge with the beef, roll pastry up so that it seals along the edge with egg wash. Cut roll into four equal pieces and place equally spaced on the lined baking trays, seam side down. Brush tops with egg wash and make a couple of slits with a sharp knife on each roll. Repeat with remaining pastry and beef mixture. Bake for 20-25 mins or until golden brown and puffed. Remove from oven and carefully transfers to a wire rack to cool. Best served while still warm and fresh from the oven with a dipping sauce of tomato ketchup mixed with a bit of dijon mustard. 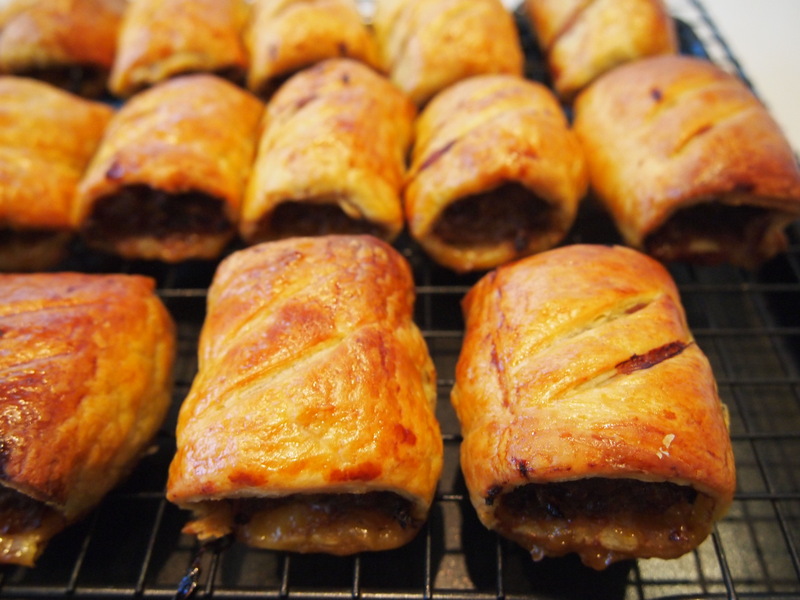 The sausage rolls can be refrigerated in an airtight container for several days and reheated in the oven or microwave. I have to bring a plate to a party on Saturday night and was wondering what on earth I was going to make – you have just solved that problem. Thanks.